Welcome to the LMLK Envelopes wing! This wing of the LMLK Museum features a variety of Stamped/Canceled Envelopes! Most of them have the stamps arranged in an inverted pyramid layout as seen in the photo; however, sometimes they were arranged like the Dipper constellation with the 20-mil directly under the 3-mil, & the 65-mil directly under the 5-mil, leaving the 10-mil exposed by itself to the far left like a panhandle. The placement of the cancellation relative to the blank spot between the top & bottom row of stamps sometimes allows any of these 3 lines to be more easily visible. The specimen in this photo is exquisite! 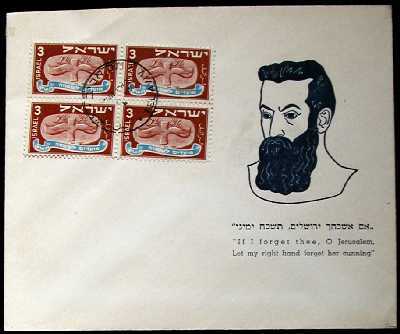 See a similar specimen in the Sol Singer collection of philatelic Judaica in the Special Collections branch of the Emory Univeristy library. 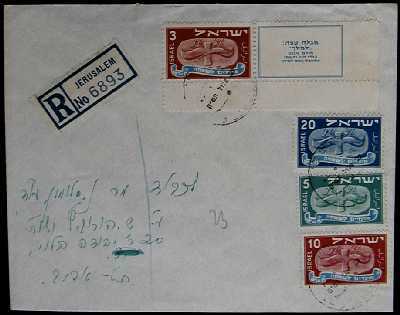 Front side bears 1 square Tabul Dove postmark & 1 round cachet both dated 3.5.1949; also Army Post Office 593 "KBA" ("Land Security Forces") triangle. 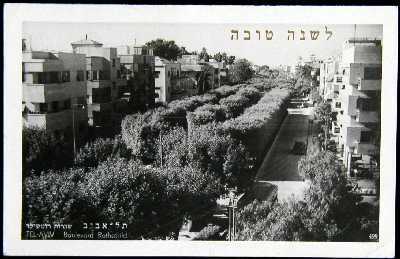 Canceled 28.1.1948 in Tel Aviv. 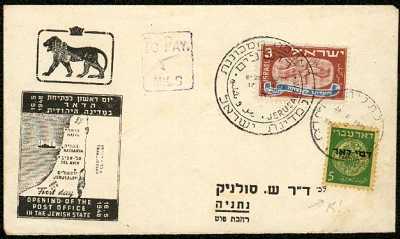 Always dated 28.1.1949 with a Tel Aviv postmark, usually they have a "1" in the bottom-left corner of card; some rare specimens don't! the end of the detainee camps in Cyprus!" 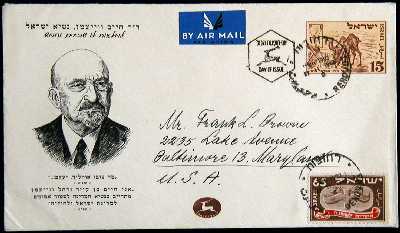 Special postmark commemorating 100th anniversary of Max Nordau's birth (co-founder of the World Zionist Organization)! 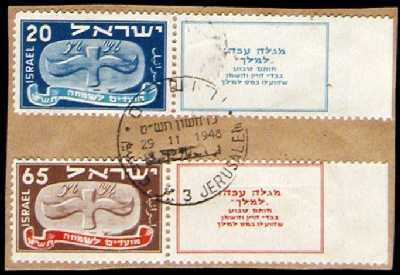 Five Jerusalem 26.9.1948 partial postmarks; 3 on front, 2 on back! 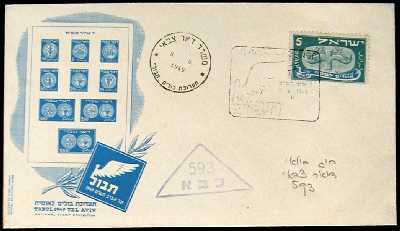 One Tel Aviv 27.9.1948 postmark also on back! 6-pruta (Valentine?) 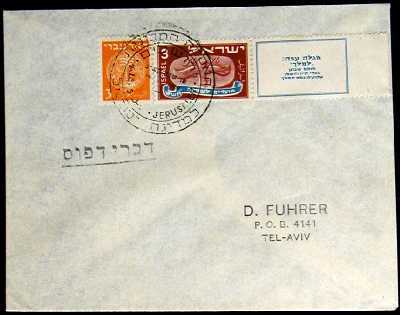 Letter to "D. Fuhrer"
Stamped address to Tel Aviv PO box with unintentional/ironic wordplay on Hitler's title! 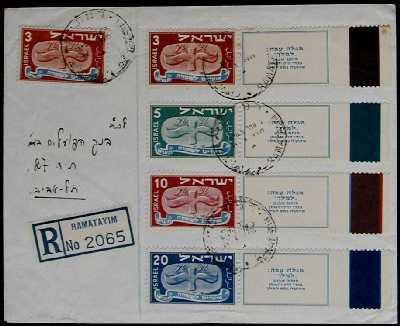 Commemorative Knesset Jerusalem postmark dated 14.2.1949, with 3-pruta tabbed Flying Scroll aligned nicely with 3-pruta Doar Ivri Coin stamp; "Printed Matter" (DBRY DPUC). 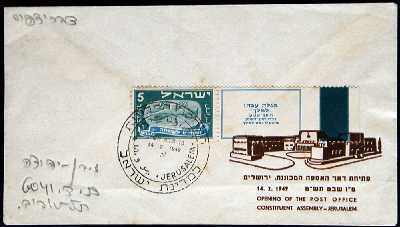 Handwritten address to Tel Aviv; 4 postmarks on front, 2 on back. All 4 tabbed stamps are adhered to envelope via left & right edges; 65-mil stamp adhered only in bottom-left corner. 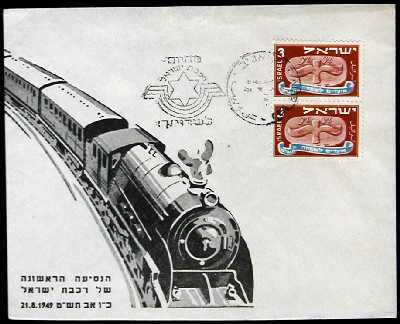 Canceled 21.8.1949 to celebrate railroad opening--the inauguration of the first Israel Railways journey! 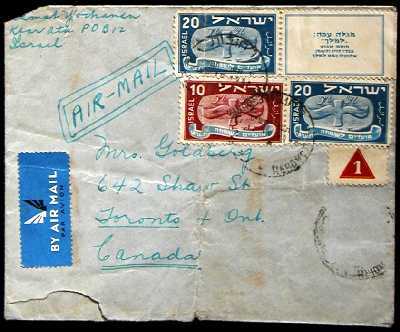 Other side has same cancellation & also 22.8.1949 Qiryat Motzkin backstamp--rider probably took this very envelope on the train from Haifa to Kiryat Motzkin! Addressed from Kfar Ata, the northernmost LMLK excavation site--territory originally assigned by God to the tribe of Asher (Joshua 19:24-31)! Note that 20-mil tab on top wraps around to the back of the envelope. 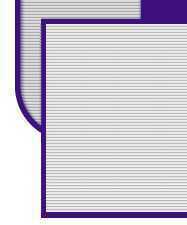 It has a plain white margin. 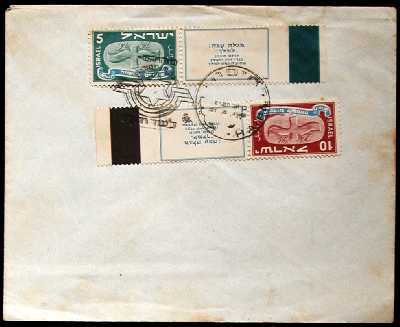 Note that Plate/Pane Number "1" triangle is not from a 5709 LMLK stamp sheet, but from an earlier issue (coin series). 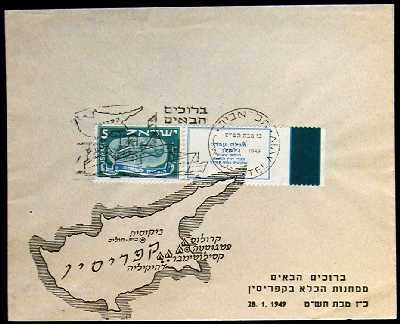 Front side bears Cyprus Refugee postmark dated 4.2.1949 from/to Haifa. 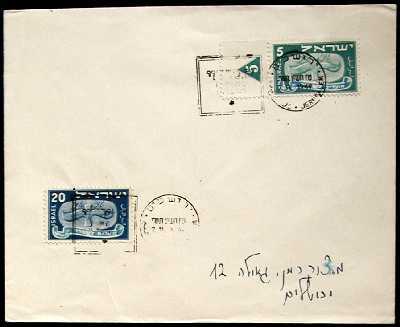 Front side bears 2 square Tabul Dove postmarks & 1 round cachet all dated 2.5.1949; also Army Post Office 593 "KBA" ("Land Security Forces") triangle. 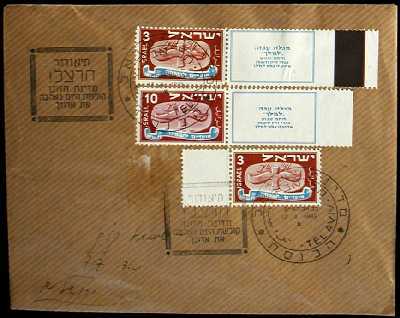 Reverse side of envelope bears 1 round Haifa "backstamp" postmark dated 5.5.1949, & mirrored ink impression from another Hebrew address. 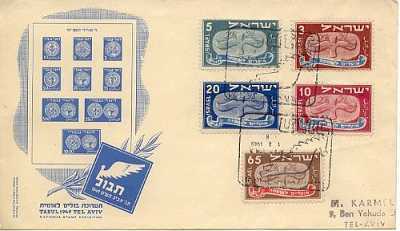 Commemorative cachet with 3-pruta LMLK stamp postmarked "14.6.1949" twice! Theodore Herzl! "Your Visioned State Lovingly Receives Your Casket"
Rare triangles used during the holy Festival period only from 1948-1955! for all our friends & sponsors! Victoriously battling tuberculosis in the land of Israel! Cyprus Ship Cachet With Paratrooper Hero! Haviva (Emma) Reik, born 1914, killed in World War II service by Ukrainian Waffen SS troops. She had been involved with the Jewish National Fund (KKL in Hebrew, JNF in English) & the Zionist Organization of Slovakia, & volunteered for numerous missions to parachute into Nazi territory to rescue her fellow Slovakian Jews & help them get to Palestine. 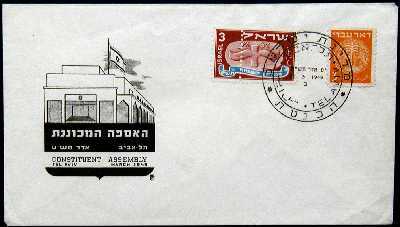 Both a kibbutz (Lehavot Haviva) & educational center (Givat Haviva) were named in her honor, & her image also appears on a 40-agorot stamp issued in 1988. 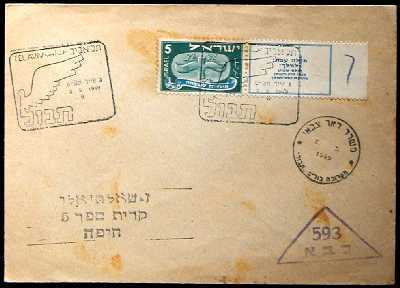 Cachet dated "28.1.1949"; Tel Aviv postmark dated "3.2.1949"
Cachet & postmark dates match: "Blessed welcome from the detainee camps in Cyprus! 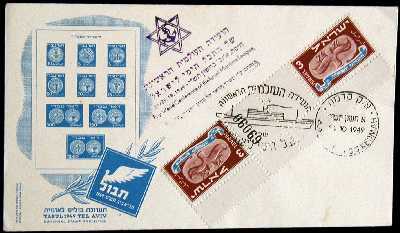 28.1.1949"
Immigration to Palestine after World War II was limited to 75,000 Jews over a period of 10 years. As this quota was rapidly exceeded by Holocaust survivors while still under British Mandate, the Cyprus camps opened on August 14th, 1946. 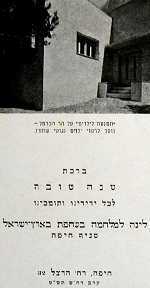 Tens of thousands of IJIs ("illegal Jewish immigrants") were detained behind barbed wire with armed sentries until Israel's declaration of independence in May of 1948; however, men of military age/ability were held with their wives & children until their official release on January 28th, 1949. All 5 stamps are adhered to envelope via margins & gutters--the stamps themselves are floating! 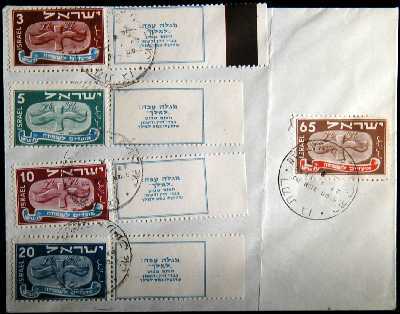 All 5 LMLK stamps covered with 2 upside-down 1.5.1949 Tabul dove postmarks. Click here to read President Weizmann's historic speech given on this important day of Israel's history! 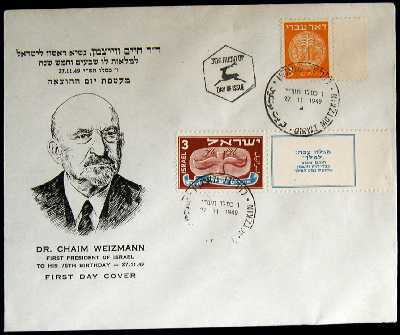 Commemorative cachet depicting the first president of Israel, canceled 27.11.1949 (his 75th birthday) in Qiryat Motzkin! Rare specimen with 3-pruta LMLK tabbed stamp & 3-pruta Doar Ivri Coin stamp with margin! 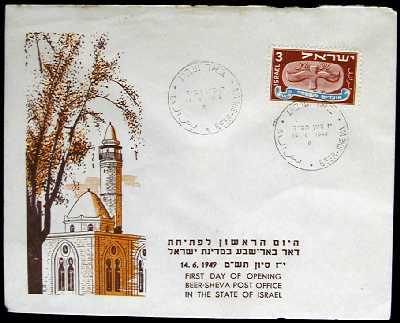 15-pruta embossed Negev Camel postal-entire FDC; the bottom-left corner of the stamp quotes Isaiah 43:20, "Because I Give Waters in the Wilderness"--Weizmann, the first president of Israel, was instrumental in getting the Negev included in the 1947 U.N. partitioning resolution! Rare specimen with 65-pruta LMLK stamp! 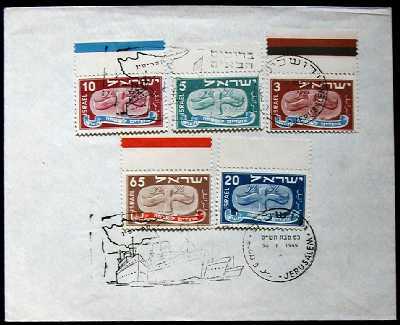 First Anniversary of Jewish State Establishment by U.N.
All 5 stamps have margins with color-control circles & square slugs! "A Year ago, this day, the 29th November, 1947 the General Assembly of the United Nations decided to partition Palestine and establish a Jewish State therein." Canceled 21.8.1949 to celebrate railroad opening--"Beginning Today, At Your Service!" By the end of World War II, the Jewish people did not possess a single significant ship. 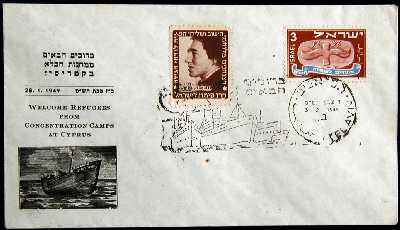 Following Israel's statehood, the Maritime Postal Service became founded on the 3,500-ton S.S. Kedmah--noteworthy as one of the fastest Mediterranean ships--at the time commemorated on these covers (October, 1949)! 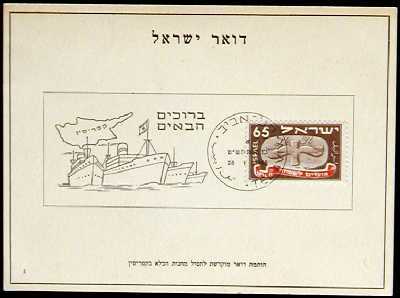 Front side bears "S/S Kedmah" ship cancellation (fragmented; 24.10.1949) covering Tel Aviv Tabul exhibition cachet; same Kedmah postmark on other side with 25.10.1949 Qiryat Motzkin backstamp. Diagonally positioned tete-beche 3-pruta supplementary printing based on its serial #06069 setting a sheet-printing precedent for either the low end (if from pane #3) or the high end (if from pane #2)! 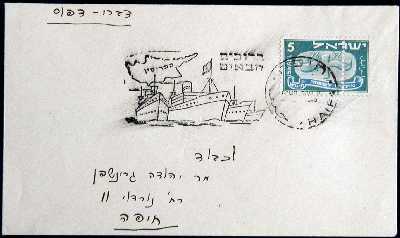 Front side bears "S/S Kedmah" ship cancellation (faint; 24.10.1949) covering Tel Aviv Tabul exhibition cachet; same Kedmah postmark on other side (smeared) with 25.10.1949 Qiryat Motzkin backstamp. Tabbed 3-pruta LMLK sheet corner of pane #1 showing rare, faded color bars across top, & faint blue excess ink along right side of tab! Sideways 3-pruta yellow/gold Doar Ivri Coin with tab--note that after its initial cruise, "Kedmah" was renamed to "Golden Isles"! 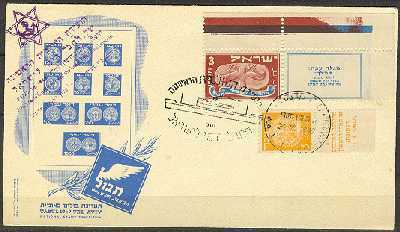 16.5.1948 cachet with royal crown over the lion of Judah, & map showing Galil, Haifa, Nathanya, Tel Aviv, Jerusalem, Negev, & Transjordan! 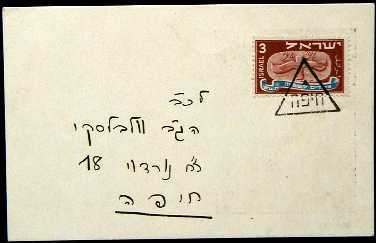 Addressed to NTNYE with 3-pruta covered by 17.2.1949 "Constituent Assembly of the State of Israel" Jerusalem postmark. 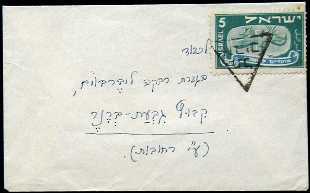 Returned "To Pay 5 Mils" (note that prutot had replaced mils in December, 1948). 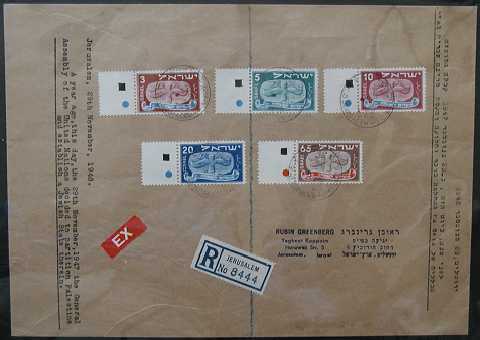 Also has 5-pruta Doar Ivri Coin stamp covered by 24.2.1949 Nathania postmark! In 1896, Herzl published his pamphlet, "Der Judenstaat" ("The Jewish State"), founded the World Zionist Organization, & became known as the father of Zionism. In 1897 after heading the first Zionist Congress in Switzerland, he wrote in his diary, "In Basel, I founded the Jewish State... If I said this aloud today, I would be answered by universal laughter. Perhaps in 5 years, & certainly in 50, everyone will agree." 50 years later in 1947 the United Nations General Assembly voted to partition Palestine into a Jewish state! 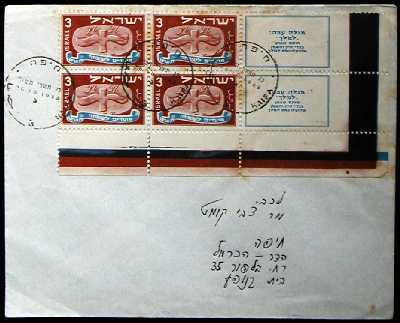 This remarkable cover has a block of 4 unseparated 3-pruta LMLK stamps, arranged in a way that symbolizes verse 33:33 of Ezekiel, dated "3-3"!!! 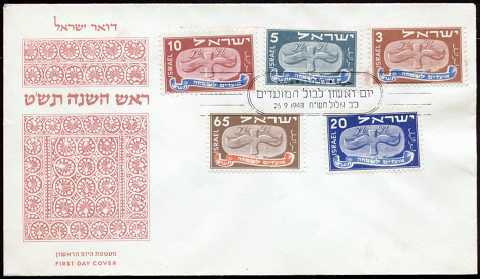 A rare philatelic combination highlighting the founding of the Jewish state & the first stamps issued during its statehood! 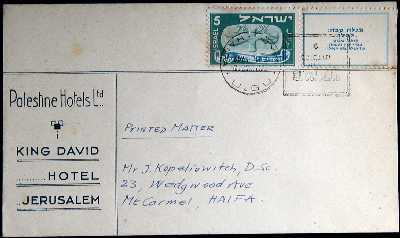 Postally used 7.11.1949 in Haifa canceled upside-down on front (commemorating 100th anniversary of Max Nordau's birth); backstamped with regular Haifa postmark overlapping the opening--the envelope was not sealed shut when it was posted. 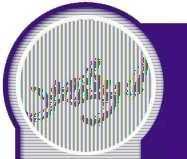 5-pruta stamp with "LMLK" tab (note that the right side of the tab margin is cut off, so it's impossible to know whether it originally had a color bar). 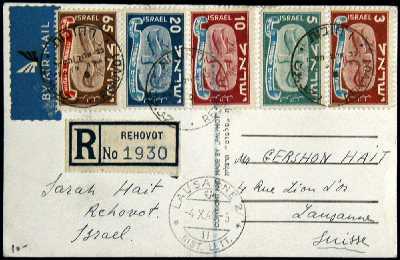 A rare philatelic combination highlighting the name of a great Israelite king, a Biblical prophecy matching the postmark & stationery, along with the King's seal!